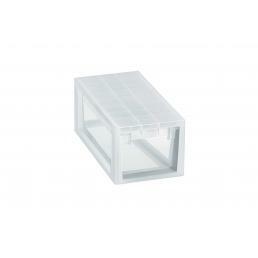 Drawers, boxes and cabinet dividers help keep order in your room or in your work space. 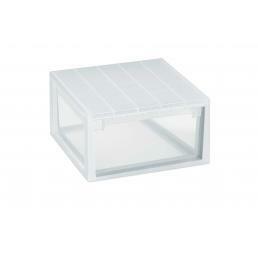 In the Mister Worker™ catalog you can find plastic drawer units, drawers for cabinets, plastic boxes and drawer dividers. LIGHT DRAWER 52 XL - tackable multi-functional drawer 22 l.
LIGHT DRAWER 52 XXL - tackable multi-functional drawer 50 l.
LIGHT DRAWER XL - Stackable multi-functional drawer 36 l.
LIGHT DRAWER L - Stackable multi-functional drawer 23 l.
LIGHT DRAWER M - Stackable multi-functional drawer 12 l.
LIGHT DRAWER S - Stackable multi-functional drawer 7 l.
Plastic boxes for closets are among the best-selling items in our catalog, because they can be used in a multitude of different environments and to store objects of various kinds: from blankets to cleaning products, from clothes to utensils professional, from toys to work tools. They are available in various shapes and sizes, depending on the use that needs to be done. The multipurpose plastic drawers are ideal for storing material that no longer serves or for tidying up heavy clothes when changing the wardrobe: being resistant resin but without hard edges, they can also be easily placed in the small bedroom. 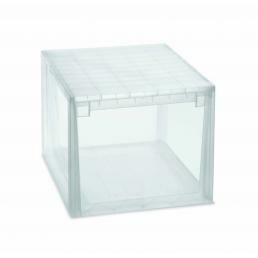 Transparent plastic containers are also available, much lighter and smaller, suitable to keep order in the bookcases of your office or inside the closet. There are also other drawers for closets, specifically designed to keep order inside the wardrobe: they are available in many different sizes, and they are all stackable, to allow everyone to organize their own space as best he believes. The most capacious and deep are ideal for storing blankets and quilts at the end of the season, while the smaller and narrow ones are perfect for keeping belts and accessories in order: the cover allows an optimal closure, to perfectly protect the contents from dust. 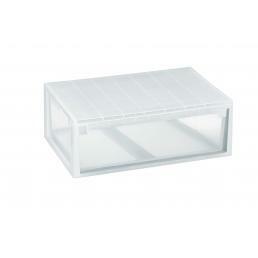 High-quality materials, comfort and design are the main elements of the plastic drawer units in our range. 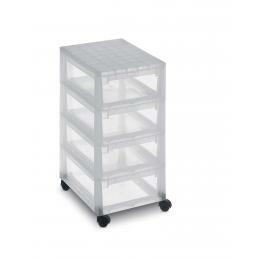 They are produced with a highly resistant and easily washable plastic, and are composed of four drawers that can be pulled out on both sides, each of which has a capacity of 12 liters and a height of 13.2 cm. Each drawer unit has four swiveling wheels, which allow it to be moved quickly and easily: the wheels can be easily detached, turning the drawer unit from cabinet to fixed. Without wheels it can become a wardrobe unit, easy to place inside the doors without shelves to create a new space for storing clothes or accessories. 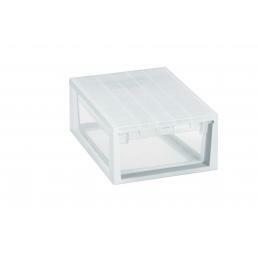 The plastic drawer units are ideal for keeping the stationery and documents in the office tidy: for example, the wheels allow you to move them quickly close to the printer, in order to immediately put printed sheets and important documents in order without the risk they fall and mingle as they are brought to the desk. They are also perfect for children's rooms, because they are practical and spacious and can contain school books, notebooks, stationery, but also toys, make-up products and accessories. Mister Worker™ has the most suitable solution, whether you need to put your wardrobe in your home or better organize your desk and bookcase. 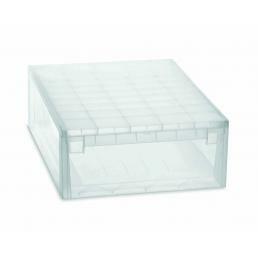 The plastic containers in the catalog are all multipurpose, available both individually and in convenient multiple sets: boxes for cabinets, multipurpose boxes for home and office, drawers for wardrobes... and some practical drawer units, highly resistant and perfect for different workspaces.